Infographics are a visual way to represent information that communicates that information quickly and clearly. This would be a great way to give a report on a topic that emphasizes the facts or the parts of the story. 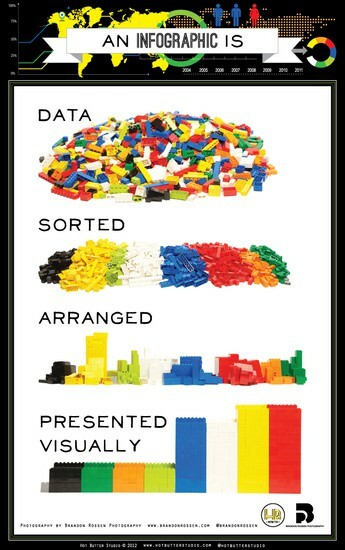 Below is an infographic from http://www.coolinfographics.com/blog/2012/9/11/what-is-an-infographic-explained-with-legos.html that uses legos to visually show the power of an infographic. Easel.ly - http://www.easel.ly - allows users to create infographics from scratch, or start from one of the pre-made "Vhemes." Once in the creation tool you have options to clear the board or edit what is there. Options include to change to a new Vheme, change the background, add shapes, text, objects, or upload your own images. The objects have a nice range of icon choices perfect for creating charts. Deleting objects can be accomplished by clicking on the item and then on the trash can icon. When working with infographics, the trick is to have the information gathered and well organized before beginning. Finished graphics can be downloaded, embedded in a website, or linked. Chrome is your best option when working with Easel.ly as it does not work in Internet Explorer. The good news is that this website does allow the use of gmail +1 accounts for student logins. (See your ITS for more information about this option). Infographics are a visual way to represent information that communicates that information quickly and clearly. This would be a great way to give a report on a topic that emphasizes the facts or the parts of the story. The trick is to make sure that the information is well organzied in order to get your point across. Below is an infographic from http://www.coolinfographics.com/blog/2012/9/11/what-is-an-infographic-explained-with-legos.html that explains this tool using legos. These are some sample infographics on education topics found online to show how an infographic can convey information.